. Published on Thursday, February 1, 2018 . Walk into any Target, Walgreens or other convenience stores in the month of February and you know that store is going to be plastered from floor to ceiling with red plush hearts, fluffy stuffed animals with heart eyes and giant heart-shaped chocolate boxes. I suppose those are cute gifts for your sweetie, but they also scream “idk what you really like soooooo ta-da, chocolate!” To avoid that path this Valentine’s Day, take a look at The Campus Crop’s picks to original Valentine’s Day gifts that will wow your partner! If your honey doesn’t like to wear their heart on their sleeve, how about these socks so they can subtly sport their love on their ankle? Sleek, lowkey and averaging around $6, the Active Cupid Mid-crew is a sweet pick! Every fandom has a couple everyone ships, from Han and Leia to the often-contested Harry and Ginny. This Valentine’s Day, you and your love can rock fandom gear that stans your fave ship but also shows off your relationship status. If Ted Mosby had ordered a custom LoveBook, “How I Met Your Mother” would have ended much, much sooner than it did. Thanks to these lil’ books, you can memorialize the story of how you and your loved one met! Start customizing your own here. It’s easy for date ideas to run dry when you and your partner are both super busy. So think ahead with this DIY date night jar! All you have to do is plan a handful of dates for the future, stick them in a mason jar, maybe top it off with a cheesy heart and voilà—a thoughtful and cute home decoration. One-up those giant cardboard hearts with the sappiest romantic gesture, a DIY string heart! This one is going to require a little bit of handy work (and some nails) but once you’re done, it will serve as the cutest wall decoration. Check out this guide for instructions. You know that cliché of people carving their initials into tree trunks to celebrate their everlasting love? Well, engraved keychains are a slightly more modern take on that. You can go the cheesy route and put your anniversary on it. Or for the forgetful date, their name. Check out this custom engraved keychain from Etsy. When Mia bought Michael a Skittles pizza with the words “sorry” on it in “The Princess Diaries,” I thought that was the most romantic thing a pizza could do. 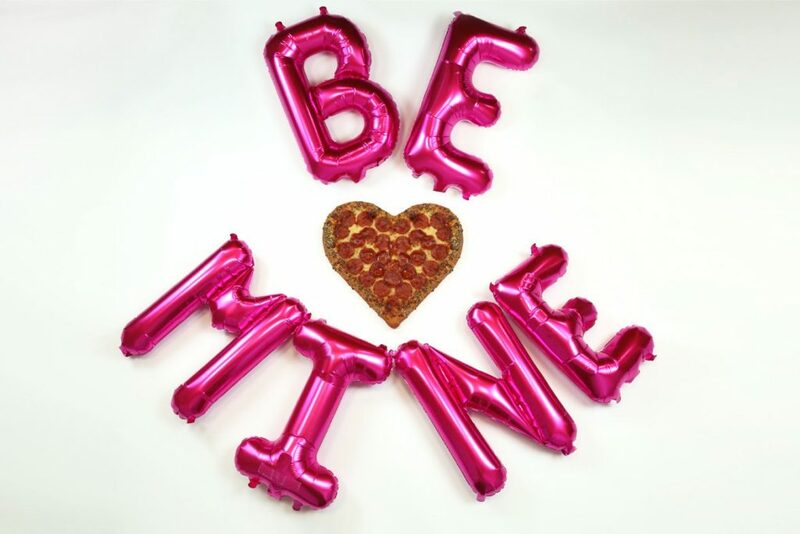 UNTIL Pizza Hut charmed romantics everywhere with their heart-shaped pizza. Be like Mia, get the pizza. Look hip and stay hydrated together with matching Hydro Flasks! You can get a basic one and decorate it with stickers to show off your wanderlust or even personalize it online. “You complete me,” said coffee mug 1. “You had me at hello,” said coffee mug 2. Get matching personalized mugs so they can date too. Get some inspo from these couple’s mugs on Etsy. This one is pricier than the rest of the items on this list, but it’s worth the splurge! If your partner doubles as your photographer then you’re going to want to invest in the Prynt Pocket SmartPhone Photo Printer. It’s a pocket-sized photo printer that allows you to print photos from your smartphone on the spot! Get yours here. Did any of these gifts catch your eye? We want to know what you’re going to surprise your valentine with! Share with us using #CampusCropChat on Facebook, Instagram and Twitter. Don’t forget to follow us on Snapchat @ASICPP!